Hello again, fellow members. Well spring is supposed to have arrived, however the cold and wet weather is still hanging around. Let’s hope it gets warmer soon so that we can all spend some time at our beach over the summer. We have had some great success in the last couple of months with our fundraising efforts for the clubhouse re-development project. 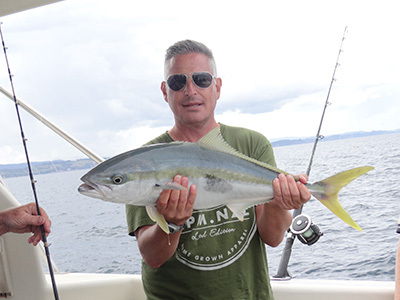 Our principal naming rights sponsor, Trust Waikato, has allocated us $30,000 to put towards our project and the Hauraki District Council has also allocated us $30,000 from their discretionary fund. The club really appreciates their support, and, as we now have final building consents, we are looking to commence the next stage of the upgrade work before the patrol season starts if at all possible. We are also looking to raise funds for furniture and fittings for the club, and will be launching a fundraising campaign to kick this off. Your support would be much appreciated! Watch this space! We are also getting ready for the new season by giving the clubhouse a bit of a spring clean and tidying up the grounds. A working bee is scheduled for Sunday 25th October (during Labour Weekend), and I encourage all members to come down and lend a hand. Many hands make light work! On the 29th/30th of August 6 crewman – Jackson Thomas, Ethan Tomaczyk, Taylor McGrath, Lachlan Goldie, Kane Cocker and Noah Paul headed to raglan to complete their crewman’s IRB exams along with Alex Polglase as their instructor, Chaz Gibbons Campbell as a probationary examiner and Jack Wilson as a event/water safety for the weekend. It was an early start for some of us who loaded up the gear from the Surf club and headed to Raglan from Whiritoa. 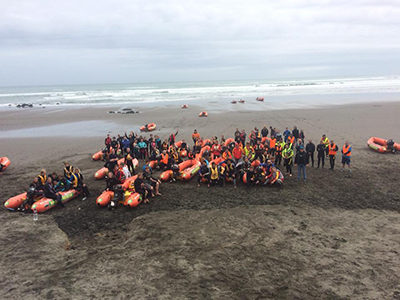 The Weekend kicked off 10am Saturday morning where the crewman’s learnt a lot of useful tips from the Instructors and examiners in Raglan. After successfully setting up all the boats we hit the beach. The conditions on the first day were marginal for examining, this means the crews got on the water for a bit of training in the hope that the conditions would pick up that afternoon or the following day so that they could be examined. Whiritoa were unlucky enough to flip their boat less than 30 minutes after the start and so we all ended up learning how to do a proper reinstatement. The conditions picked up that Saturday afternoon and 3 of our crewman were lucky enough to sit their exams and Taylor, Lachlan and Ethan all passed – Congratulations boys. Saturday night everyone had a good evening of being well fed and socialising with the other clubs at the lodge.Sunday morning everyone was back at the club bright and early and the conditions were much more challenging. The rest of the crewman set up the boats and hit the beach to await their exam. All of the boys examined on Sunday – Noah, Jackson and Kane passed their exams with the help of Alex’s driving skills in these tough conditions. The Sunday was topped off with the news that Chaz had successfully completed a majority of his probationary examiners award and now awaits final sign off by the regional chief examiner to become a fully qualified IRB examiner. The weekend ended successfully with a full gear pack down. Overall all the Whiritoa crew performed really well and we are stoked to have 6 more crewmen at the club for the coming season. Everyone enjoyed the different conditions and the experience at raglan and can’t wait until next year. I would like to pass on a huge thanks to Alex and Jack who really stepped up and made the weekend a success for our candidates. These guys helped with the gear transport, the training, the organising of the training and heaps more! without them it could not have been done. The feedback I received from other examiners and instructors about Whiritoa was really positive and it’s great to hear this about our team. Keep up the awesome work! Cant wait for next year! The Surf Life Saving New Zealand BP Leaders for Life programme wrapped up on the 24th of August with 10 candidates graduating. Leaders for Life is to enhance the ability of current and emerging leaders within the surf lifesaving community to make a real difference to their clubs and across the wider organisation. In our environment, we know that leaders are effective when they are collaborative in their approach, are aware of their strengths and weaknesses and have a strong desire to improve. 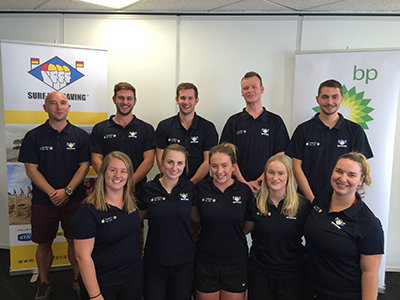 The programme brings young leaders from within Surf Life Saving New Zealand together to enhance their leadership skills and qualities. The programme ran over three months, one weekend in each, each workshop consisted of different modules as well as guest speakers. We also were put into groups and given a project to work on is our spare time which we had to present at the final workshop. I found the programme extremely rewarding and was able to take away a lot of useful learnings, getting to meet some awesome people from other clubs and being able to work on a project which was of interest to all was pretty cool too and has so far proven to be very successful with local lifesaving committees from different regions discussing the topic. Some of the topics which we discussed were around personal development, values, communication and negotiation to name a few, the speakers who attended also tied in well with the topics which we were discussing and were able to bring real life experiences to the discussion. I would like to say a big thankyou to the committee and especially Michael Jeffs for encouraging me to attend and endorsing my application. We are having a Quiz Night at Labour weekend on October 24th to help our team fundraise for the ANZAC Exchange. Olly Clifton, Chaz Gibbons and myself are heading over to Australia in January after hosting the Aussie team here. We are looking to raise funds to help towards our airfares and car hire/operating costs so have put together and quiz night. Come on down to the surf club on Saturday night for an epic evening of fun filled facts, we would love to have your support! Garry Christoffersen, General Committee Member is writing the “Between the Flags” column in the Whiritoa Tidings publication. 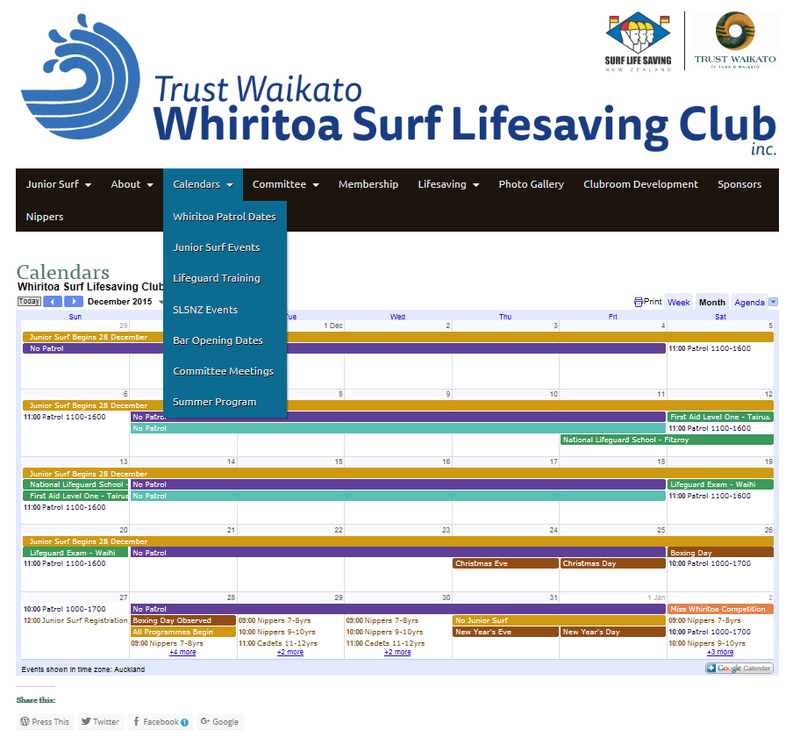 Welcome to this, the first edition of news from the Trust Waikato Whiritoa Lifeguard Service. The purpose of this monthly column is to keep the Whiritoa community involved in what is going on at the club. At the moment all appears pretty quiet. However, behind the scenes we are already planning for the next summer season. Just over four and half months before we start patrolling again! The exciting news of July was that we were awarded “Coromandel Life Saving Patrol Club of the year for 2015”. To put this into perspective, clubs like Whangamata, Wahi Beach and Pauanui were in our category. This award is a credit to the dedication of volunteer lifeguards, coaches and instructors and all the people behind the scenes that help our club of over 500 members operate over summer. Another thing keeping us busy is the club redevelopment project. The first stage, coming up two years old, is the lifeguard only outdoor courtyard (the blockwall “compound” adjacent to Kon Tiki Road) and the shadesails in front of the building. Stage two of the project is layout changes inside the building to make the space more useful and replacement of the chipboard floor, because after three sandings it is a little worse for wear in places. A general spruce up of the entire building inside and out will ensure it remains an asset to the community for years to come. The estimate to complete stage two is $150,000. Fundraising to date is close to $40,000, yes still quite a way to go. We are currently working on additional fundraising initiatives, however if anybody as any ideas or a bit of spare cash under their mattress, please contact me or Michael Jeffs (Club President) on mjjkiwi@gmail.com or 021 573 234. You would have noticed by now the addition of the new post and rope barriers on each side of the beach accessway opposite the tennis courts … as well as the new dune planting of course! In the not too distant future, Council will be replacing the wooden beach access ramp adjacent to the club with a recycled plastic version, held together with stainless steel chain. The individual slats are going to be wider and longer, and should be a bit easier on bare feet! At the same time the access ramp is replaced, the turn-around area at the top of the ramp is going to be regraded. This is being done to direct water during heavy rain into the adjacent reserve, rather than running down the ramp and scouring out the sand. The old wooden beach access ramp is to be reused as a formal pedestrian beach access from the playground reserve adjacent to the surf club. This is the beach access that was closed off last summer season because of the damage pedestrians were doing to the dunes. The committee is working through an extensive list of essential equipment due for replacement. A key item purchased with the help of a $4,500 grant from the kind folk at Trillian Trust is a new outboard motor for the IRB’s. This means we have an outboard motor surplus to requirements. The motor is a 2006 Mercury badged Tohatsu 30HP 2-stroke engine, with standard New Zealand surf modifications including propeller guard and surf prop. It is in good condition and we are asking $1,950 ONO. If anybody is interested, contact Malcolm on 027 439 3144. Last month I mentioned we are fundraising for $150,000 to undertake internal building redevelopment to make the club more useable. After a submission and presentation, we are pleased to report the Hauraki District Council has given us a grant of $30,000. With $70,000 of fundraising in the bank, the committee is looking at the feasibility of undertaking part of the redevelopment works before the summer season. We will provide update on progress next month. Daylight savings is here and the summer is approaching faster than you can say “surfs up”. Before we realise it lifeguards will be patrolling our beach in the weekends. To get ready for the summer season we need to do some work around the club. You know cleaning, throwing out junk and various maintenance tasks around the place … everything we avoid at home! So to spread the workload we are having a working bee on Sunday 25th October @ 10.00am, all hands welcome. After the work is done we will throw a few sausages on the newly cleaned BBQ. By now I am sure you would have noticed the marker posts at the top of the beach access ways. But have you noticed that they are all numbered? After talking to the Council, numbers have been put on all the marked access ways, starting from the lagoon working south towards the blow hole. The idea behind the numbering is to assist lifeguards when training or responding to emergencies. We think this idea will be particularly helpful for people unfamiliar with Whiritoa. Last surf season the club purchased the new Yamaha Viking “side by side” that you would have seen patrolling the beach last summer. The previous “side by side”, the red Polaris, is now surplus to our requirements and available for sale. It was purchased new by the club in December 2011, is in good condition and we are asking $7,950 ONO. If anybody is interested, contact Malcolm on 027 439 3144. Last month I mentioned we have enough fundraising in the bank to start some of the Clubhouse redevelopment works. We are working through the finer details of getting the work completed in the lifeguard kitchen area and the bunkroom used by the lifeguards before Christmas. The timeframe is going to be pretty tight, but doable … we think!